Fighter pilots are perhaps the deadliest yet most detached warriors to ever engage in battle. Those who possessed the best maneuvering traits, spatial awareness and marksmanship define history as the greatest aerial aces. We’ve taken into account not just kills, but also time in service, difficulty of flying conditions and the nature of their missions. Major Erich Hartman was a Luftwaffe fighter ace who is recognized for having shot down more enemy aircraft than any pilot in history. He became known as the “Blond Knight” or “Black Devil” by his enemies, shooting down 352 aircraft in his combat service between 1943 and 1945. His mother was one of the first women pilots in Germany, and taught him to fly as a child. He served as a gliding instructor by age 14, and received his pilot’s license in 1939 at age 17. His combat technique was to stalk an enemy fighter and wait until he was within around 66 yards before opening fire. This approach would nearly guarantee a hit. He was never shot down in his three years of air combat, but was forced to crash land several times after midair collisions. He served 10 years in a Soviet POW Camp, and died of natural causes in 1993 at age 71. Captain Hans-Joachim Marseille was a German fighter pilot of French ancestry with 158 confirmed kills. Marseille shot down more British and American fighters than any other pilot in the war in his sorties against the British Desert Air Force. He may have been more skilled than Hartmann, who usually shot down Russian aircraft piloted by less experienced airmen. But his extravagant nightlife often limited his participation in combat, which led to his transfer to North Africa. His unique combat technique was to infiltrate enemy formations and slow down while turning tightly. Once he was surrounded, he used the low speed of the aircraft and its ability to turn rapidly to spray multiple aircraft with bullets, “blowing up the formation from the inside” in Marseille’s words. Marseille’s WWII service began in 1940, and ended in 1942 when he was killed after attempting to bail out of his damaged aircraft. Major Gerhard Barkhorn was the second highest scoring fighter ace in history, with 300 victories from 1941-45. He served in the eastern front, where he developed his target leading skills and became greatly feared. After shooting down Hero of the Soviet Union Nikolay Klepikov and later reaching 250 victories, he had a bounty placed on him. He experienced anxiety issues throughout the war, and had a history of being transferred to easier assignments. He was awarded the Swords of the Knight’s Cross in 1944, and had the distinction of serving as Erich Hartmann’s best man. He died in a car accident in 1983 at age 63. Flight Lieutenant George “Buzz” Beurling was a fierce Canadian fighter pilot who shot down 31 aircraft in a range of European air battles. He was known as somewhat of a loner who avoided smoking or socializing and dedicated himself to perfecting his fighting technique. He took down many German and Italian fighters with his aggressive approach that was similar to Hartmann’s. Beurling’s outstanding vision and in-depth study of ballistics made him the equivalent of an aerial SWAT team member. He combined his incredible skill and marksmanship with ferocious maneuvering, making it nearly impossible to shake him off or shoot him down. He survived the war, but was killed in a transport crash. Russian-Ukrainian Aviation Marshall Ivan Kozhedub fought 120 air battles in WWII and shot down 62 German planes, making him the highest scoring Allied pilot. Kozhedub served throughout the entire war in the fearsome Lavochkin LA-7 fighter, which had a top speed of over 600 kph. Nicknamed “Ivan the Terrible,” Kozhedub was known for his nearly superhuman marksmanship over long distances. Coupled with the power of his aircraft, this ability allowed him to bring down one of the Luftwaffe’s new jet fighters as well as 61 prop fighters. Kozhedub remained in the Russian Air Force until 1985, where he was awarded the Hero of the Soviet Union three times for his skill and bravery in combat. Kozhedub went on to fight in the Korean War, putting him at odds with his former allies. Major Richard “Ace of Aces” Bong was the highest scoring pilot in the US Air Force, with 40 kills recorded in battle against Japan. Bong scored all his kills in the twin engine Lockheed P 38 Lightning, making him the deadliest twin engine pilot in history. Lockheed Lightnings were able to quickly shred enemy aircraft with machine gun fire, and were used by the US Air Force over both Germany and the Pacific. Bong actually had mediocre gun skills, and compensated by flying extremely close to his targets, nearly colliding before shooting them out of the sky. These “fly by shootings” were extremely effective, but in one case he crashed right through an enemy fighter instead of shooting it down. Major Bong survived the war, but was tragically killed in a jet fighter crash in 1945. Japanese Zero pilot Hiroyoshi Nishizawa was possibly the top scoring Ace in the Imperial Japanese Navy in WWII. He claimed his 87 aerial victories over four years of combat. He shot down all kinds of planes, and had a provocative attitude that led him to perform aerobatics over an enemy airfield with two wingmen, resulting in a written invitation from the US Navy to return for “the rest of the party.” Nishizawa’s unique fighting style kept him from being shot down while decimating enemy fighter formations. He was noted for performing spectacular, high G force maneuvers in random patterns, which had “never been seen in Japanese air combat.” He avoided death as a fighter pilot, but in a somewhat anti-climactic ending was killed when a bomber transporting him was shot down. Senior Lieutenant Kurt Welter was Germany’s top jet fighter pilot and the highest scoring jet ace in aviation history. Welter prowled the European skies in his lethal Messerschmitt ME262, in which he shot down a significant portion of his 63 confirmed kills. 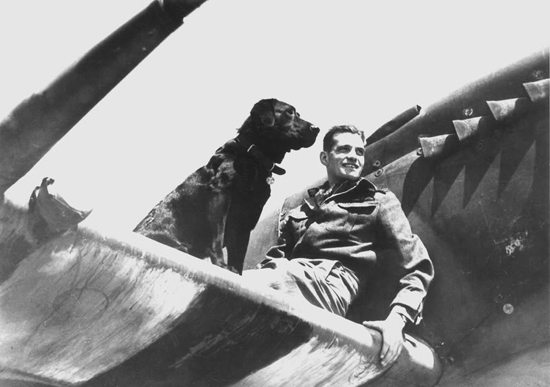 Welter was the first jet pilot to fly night missions where he made impressive kills, including heavy bombers. Traveling at over 700 kph in pitch black skies, Welter could destroy an enemy aircraft and attack the next target before the formation knew what hit them. Twin engine British Mosquitos modified for night fighting were among his most frequent victims. Welter survived the war, and was awarded the Iron Cross and German Gold Cross for his exploits. Air Vice Marshal James “Johnnie” Johnson was the Royal Air Force’s top scoring pilot with 34 individual kills and several shared. Johnson’s great skill in aircraft handling, proactive fighting techniques and marksmanship gave him the highest scores against the Luftwaffe of any British ace, which he achieved in his Supermarine Spitfire. His favored technique was to shoot at enemy aircraft in an offensive manner to panic the enemy and gain the advantage by encouraging them to flee. Johnson would then single out targets and pick them off. He had an interest in engineering, and took the time to analyze situations for possible traps rather than blindly attacking. In his personal life he overcame personal injury to join the RAF. Johnson survived the war, dying peacefully in 2001 at the age of 85. During the Battle of Britain, foreign pilots volunteered to fight with the Royal Air Force. Czech Sergeant Josef Frantisek was one of these pilots, having reached Britain after escaping internment in Romania. After flying with the French, Frantisek signed up with the RAF, but was so independent in searching for the enemy that he was loaned an aircraft for his one man war. Flying his Hawker Hurricane, Frantisek went on to become the top scoring Allied Ace in the Battle of Britain, with 17 kills. He often targeted returning German fighters, knocking them out of the sky before they could cross the English channel. He claimed a total of 17 fighters, flying only one year in combat. He was not shot down, but crashed his Hurricane in 1940 while performing aerobatics, possibly to impress his girlfriend, possibly from sheer exhaustion. Want to read about more World War II heroics? We’ve got a list of little known heroes of the Holocaust, as well as a list of acts of kindness during the conflict. Sorry, but the deadliest fighter pilot ever, by far, is Heinz Schnaufer. 121kills on RAF bombers, the vast majority crewed by 7 airmen -most of them did not survive. Schnaufer was able to eliminate at least 700 airmen – more than double than Hartmann. They flew also during the long winter, often with not-so-good planes and usually severely outnumbered. Thanks for adding this information. We appreciate it when readers add their opinions. Pat Pattle – the best! Juutilainen of Finland had 94 kills and was never hit by enemy fire. Also Khozedub flew planes other than the La-7. How was this list compiled? If it was based on kills, as the title suggests, then all ten spots would be occupied by German pilots. Agreed ! What a joke. All top ten pilots were Luftwaffe aces. Lets begin shall we. And many, many more Luftwaffe aces with between 100-200 air victories. This list is not very comprehensive and it is not accurate in facts…A few corrections here for this story. Johnny Johnson shot down 38 aircraft, not 34. Also, he was not the top British ace. That crown belongs to Marmaduke St. John Pattle, who shot down AT LEAST 41 German and Italian aircraft during the North African/ Mediterranean air battles of 1940-41 before he was killed in action. Also, there are at least 60 Luftwaffe pilots whose individual scores ran anywhere from 30 to 250 kills each. And remember, a Luftwaffe pilot had to shoot down 10 aircraft to make ace, while allied pilots only needed five. How about Heinrich Erler (212) ,Heinz Baer (220), Adolf Galland (104), Wilhelm Batz (250), Werner Molders (115) Kurt Buhligen (112). Now that’s bravery and worthy of ace hood. St John Pat Pattle wasn’t British, although he flew in the RAF. He was South African. Hans Ehlers is the greatest DAYLIGHT heavy bomber killer of all time. Are you serious? Richard Bond one of the 10 best? There are 359 german fighter pilots with more kills than Richard bong and several japanese finish and soviet pilots. And Rudel is not even mentioned as well as Mölders and Galland. Rudel, altough he did achieved 5 planes destroyed, wasnt a fighter pilot. In my opinion tho, this list should be filled from 1st to 10th place with Germans, since they were the one who achieved most successes in the air and most aerial victories. 1st to 10th place belongs to German pilots, and so on……. The most scoring fighter ace after German pilots was Finnish fighter pilot, warrant officer Ilmari Juutilainen. He shot down officially 94 Russian planes during second world war. He flew in Fokker D21, Brewster 239 (Buffalo) and Messerschmidt 109 G2 and G6. HAHAH… This list is a joke.. Germans were the best pilots ..You can’t deny history. Too busy “zapping” innocent German civilians (war crime). One area in which Americans were “aces” at. Dresden! If you look at the list of top scoring aces, you will notice that the list is owned by germans. They still lost the airwar though. The Top 126 are occupied by Luftwaffe. It is interesting to note that they hold the record for both prop and jet planes. What about Snoopy? He shot down the Red Baron !! As far as i know Pattle (highest scoring Brit) was a South African pilot born in Durban South Africa. He flew for the British as part of the commonwealth forces. So strictly speaking he should not be named as a British ace but as a South African ace. What might be missed here is the fact that Luftwaffe pilots, undeniably superb, were able to fly far more missions over Europe than their Allied enemy. German fighter pilots took off in the morning from German soil and returned there at night. Allied pilots who tangled with them over Europe had to fly long distances. Also, when German pilots got shot down, they were able to go back up. American pilots who got shot down spent the rest of the war in POW camp. Except for Bob Hoover, who got shown, was taken prisoner, escaped, and fought again. How did we win the Battle of Britain with superior german planes and pilots?